So the recent Microsoft reorganisation really was Steve Ballmer's last throw of the dice. In the biggest news to hit the PC industry for some time, the CEO has decided now's the time to go. But in what shape does he leave the company? Ballmer is a sales guy, so figures first. Microsoft recorded a whopping $77.85 billion in revenue, with operating income at $26.74 billion during the financial year just passed. That's not the earnings of an unsuccessful company, and Ballmer has played a role in Microsoft's rise and rise that only William Henry Gates III can better. I'd be surprised if Ballmer wouldn't have wanted to stick around at a successful Microsoft, so there are several possible conclusions – firstly that he was pushed. Secondly, he doesn't want to stick around for the long haul and wants to go fishing. Thirdly, that he doesn't think the future for Microsoft is that rosy. Finally, and most unlikely, he could have been at odds with its new direction. This final point is a little moot. Microsoft was clear in its One Microsoft vision statement that it wants to be more of a "devices and services" company. Ballmer played a big part in this reinvention. But certainly this news puts question marks over the wisdom and reasoning of removing key personnel during recent times, most notably head of Windows Steven Sinofsky late last year just a month after the release of Windows 8 and the so-far, so fail Windows RT. The aim of the reorganisation was to be more siloed, more able to react to developments in the industry. Microsoft has long lacked the ability to be lithe and react quickly - exactly the opposite of key competitors like Google. It didn't put much stock in smartphones until it was a bit too late, the same with online cloud services and tablets. Microsoft now has sizeable offerings in these spaces, but they often don't hang together as well as the competition. This is not an organisation that can't make money, but it is one that is losing some confidence from customers. And, crucially, investors. As the Associated Press succinctly put it in its article about the Microsoft reorganisation, "During Ballmer's reign, Microsoft's stock has slipped by nearly 40 percent even as the company's annual revenue has roughly quadrupled from $20 billion to nearly $80 billion." A lot of people are still buying PCs. A lot of people are still buying Windows and Office. We and many others love Windows Phone and it is destined for a decent third place behind iOS and Android. Office 365 is a really compelling offering. Despite the Xbox One shenanigans, it'll still sell bucket loads of consoles. But investors clearly haven't been impressed over recent years by Microsoft's pace compared to Google and Apple. And Microsoft hasn't helped itself through several big booboos that have not endeared it to the public, analysts press and investors – but have been music to the ears of rivals. 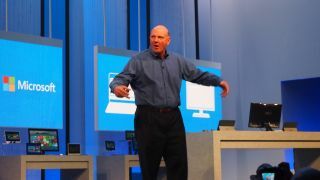 Although it will come good and the idea has merit, the Ballmer/Sinofsky tenure has seen Windows now transformed into a confused and conflicted operating system with huge numbers of terrible apps – not least those from Microsoft itself. Efforts in the tablet market have been a disaster. Surface Pro is a thoroughly decent mobile PC, but Surface RT has been so poorly marketed, received and thought-out that it is impossible not to wonder how a company with such a wealth of resources can get something so very wrong. Added to which there were numerous foot-in-mouth moments like his criticism of Dropbox and denouncement of the iPhone. The CEO of the new One Microsoft needs to clear up the mess of the Windows/tablet strategy and capitalise on Microsoft's other strengths. Clearly Steven Anthony Ballmer feels he's not the right guy to do it. "There is never a perfect time for this type of transition, but now is the right time," he says. It's probably for the long term good of the company that he's stepping out before Microsoft is too far into its new era. Whoever picks up the baton will take charge of one of the most remarkable and profitable companies the world has ever seen, yet one that has multi-billion dollar challenges ahead. A new broom could be the very best thing for it. But, whoever it is, they probably won't do this.